Ghouls, dragons, were-beasts, and Dracula. Creatures of the spirit realm and swamp – these are the monsters that are a bump in the night, the faces you see when your eyes are sealed shut. Uncover the full monstrosity of Marvel as you enter dark lairs and dimensions! Meet the new, and even more depraved, Legion of Monsters! Morbius the Living Vampire, Werewolf by Night, the Living Mummy, the indomitable Man-Thing; these creatures all share a thirst for blood, but without firm leadership their resolve is scattered. Who will become leader of the Legion? Man-Thing is a true product of its environment; Marvel's resident swamp dweller is a mysterious figure of regenerating muck and ever-growing vines. See the Thunderbolts recruit the Silent One, as it defends the Nexus of Reality. Plus, a glimpse into the past of Ted Sallis, pre-transformation into Man-Thing! From the Marvel vault, we bring you a spine-chilling tale about the Original Vampire. Frank Drake has long been out of touch with his Transylvanian ancestry- until he inherits Count Dracula's castle! Drake gets more than he bargained for on this holiday, dodging death and bloodstained fangs at every turn! Jack Russell is the Werewolf by Night. Inheriting a lycanthropic curse passed down for generations, the full moon becomes his enemy and savior. Werewolf by Night defends fellow were-creature Wolfsbane from satanic foes. A demon dog pile ensues as Werewolf takes on Cerberus, three-headed hound from hell! Meet the Agents of H.A.T.E., a ragtag crew of monster hunting pros. Meet Fin Fang Foom, Chinese dragon intent on chaos. When Fin Fang Foom arrives in New York City with a bloodlust, it's up to Machine Man to prevent citywide slaughter. The Punisher is dead, and a Frankenstein monster is wearing his body! Rick Remender kicks off the Franken-Castle arc, a nightmarish tale of gore and weird science. In the underbelly of Monster Metropolis, a science experiment yields a fearsome abomination. It's a Ghoulish Gala for the ages as Deadpool takes an undead bride! Meet Shiklah, the succubus who not only claimed the heart of Deadpool, but is also Queen of the Undead! With a guest list this terrifying, you'll have no choice but to attend. An added bonus? Wade Wilson's romantic history laid out in full! Michael Morbius is a creature unlike any other. Instead of becoming a vampire through the 'bite of death', Morbius achieved vampirism through genetic engineering. In the first issue of his limited series, Morbius is a disoriented fugitive. The origin of the Living Vampire retold, from his past as a sickly child to his present as Drifter of the Night. The Agents of H.A.T.E. versus the Mindless Ones! A small American town has been overrun by silent, yet dangerous, demons of Dormammu. With their assimilation skills and laser beam eyes, the Agents are up against their fiercest foes yet! Earth's Mightiest Heroes get a hellish makeover as Avengers of the Undead! Rick Remender brings you Rise of the Descendants, the Secret Avengers arc that still has tongues wagging. Captain America's a werewolf! Daredevil an actual devil! It all converges in Monster Metropolis, heart of the underground monster scene. Welcome to Monster Island! Hope you survive the...oh, you get the drift. The X-Men take on the home world of Marvel's monsters after several of its residents venture off-shore. Meet the new, and even more depraved, Legion of Monsters! Morbius the Living Vampire, Werewolf by Night, the Living Mummy, the indomitable Man-Thing – check out these night stalking creatures in action! Man-Thing is a true product of its environment – Marvel's resident swamp dweller cuts an enigmatic figure of regenerating muck and vines. See the Thunderbolts recruit the Silent One as it defends the Nexus of All Realities. From the Marvel vault, we bring you a spine-chilling tale of the Original Vampire. Frank Drake has long been out of touch with his Transylvanian ancestry – until he inherits Count Dracula's castle! Jack Russell is the Werewolf by Night. After inheriting a lycanthropic curse passed down for generations, the full moon becomes his enemy and savior. Meet the Agents of H.A.T.E., a ragtag crew of monster hunting pros. Meet Fin Fang Foom, Chinese dragon intent on chaos. When Fin Fang Foom arrives in New York City, it's up to Machine Man to prevent citywide slaughter. The Punisher is dead, and a Frankenstein monster is wearing his body! Rick Remender kicks off the Franken-Castle arc, a nightmarish tale of gore and weird science. It's a Ghoulish Gala for the ages as Deadpool takes an undead bride! Meet Shiklah, the succubus who not only claimed the heart of Deadpool, but is also Queen of the Undead! Michael Morbius is a creature unlike any other. Instead of becoming a vampire through the 'bite of death', Morbius achieved vampirism through genetic engineering. The origin of the Living Vampire is retold! The Agents of H.A.T.E. versus the Mindless Ones! A small American town has been overrun by silent, yet dangerous, demons of Dormammu. 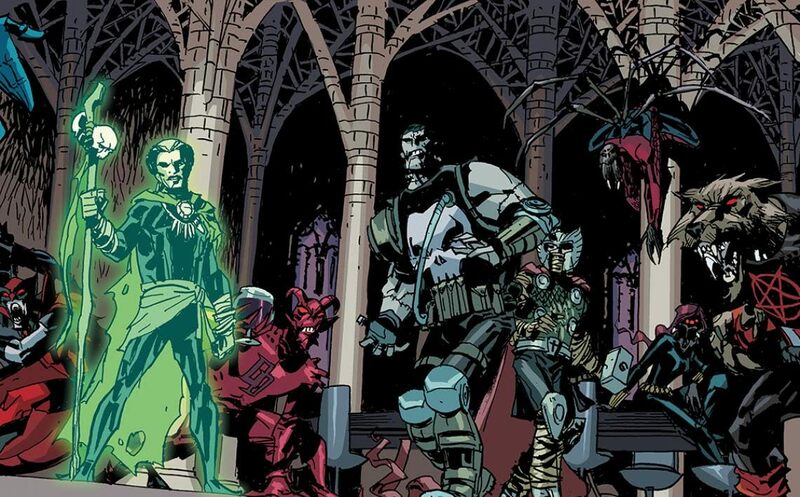 Earth's Mightiest Heroes get a hellish makeover as Avengers of the Undead! Captain America's a werewolf! Daredevil an actual devil! It all converges in Monster Metropolis, heart of Marvel’s monster scene.